In match play scoring, the number of holes won determines the winner rather than total strokes. Match play is a variation of the more traditional scoring method of stroke play in golf. More emphasis is placed on the result of each hole as opposed to accumulating the lowest number of strokes for the entire round. Some professional tournaments - such as the Ryder Cup, the Presidents Cup and the Volvo World Match Play Championship - feature a match play scoring system. Match play differs from stroke play in that the scoring is based on the number of holes that are won during the round as opposed to the number of strokes accumulated. As a result, the number of strokes it takes to win a hole becomes virtually irrelevant. In effect, this type of play can be viewed as a series of 18 separate games within a round. In match play, the player or team with the lowest total score for the hole wins the hole and is awarded a point. In the event of a tie, each is awarded a half-point, meaning the hole is “halved.” At the end of the round, the player or team with the most points is declared the winner. In team play, the lowest score on each team is often used to determine the winner of each hole. Match play has its own distinct terminology. At any point during the round, when the score is tied, it is said to be “all square.” If one player or team has a two-hole lead, it is stated as being “2 up.” If the number by which a player or team is ahead matches the number of holes remaining, the leading team is said to be “dormie.” The final score is stated as a function of the margin of victory. For example, if one team has a four-hole lead after 16 holes, it means there is no way the second team can win and the match is over. The final score is stated and “4 and 2,” meaning the first team had a four-hole lead with only two holes remaining. Because of the nature of the scoring system, golfers in match play can often be more aggressive. Because the total number of strokes does not necessarily matter, a player can take a more risky shot, knowing an errant result will not have a large impact on the final score. In team match play, one method of play is for one golfer to take an aggressive approach while the other counteracts with a more conservative style. Fourball match play occurs when teams of two are pitted against each other. Each golfer plays his own ball throughout the hole, and the score of the player with the lowest total for the hole is used. A variation of this game involves players alternating shots. For example, the first player hits the tee shot, the second player hits the next shot, the first player hits third shot, and so on until the hole is completed. 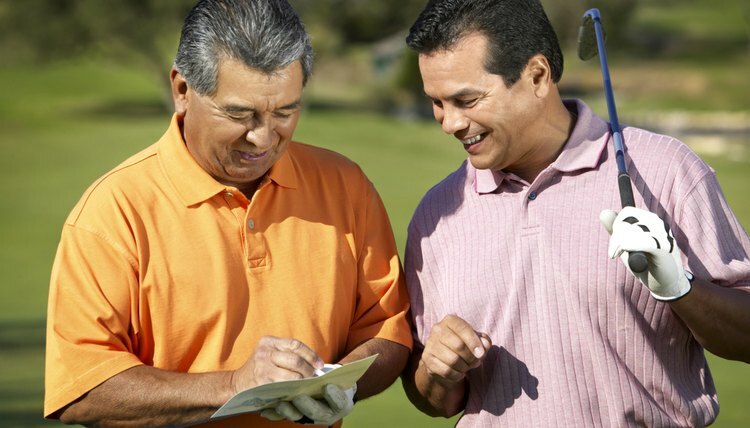 How Do I Score Match Play Golf?